In Syria, the U.S. is directing the lion's share of its energy towards defeating the Islamic State (ISIS) rather than containing Iran. Reflecting that reality, the caliphate's days on the physical battlefield are numbered with U.S.-backed forces assaulting their de facto capital in Raqqa. As a result, the other major powers and patrons involved in the Syrian cauldron are redeploying their forces as they vie for political, economic, or military influence over its future. The situation brings into focus the other fronts opening up that have far more to do with Iran than ISIS. Ready or not, the race is on in the south and east and how those upcoming battles play out will likely shape the balance of power in the region. It is in this unfolding context that one should view the recent White House warning to Bashar al-Assad over the use of chemical weapons. It comes amid a noticeable escalation in Syria involving pro-Assad regime attacks against U.S. coalition positions in the north and south, America's downing of a Syrian fighter jet and several Iranian drones, and Iran's firing of ballistic missiles into eastern Syria. Iran remains on the march and poses a greater long-term strategic threat to the United States and its allies than does ISIS. Having succeeded in effectively propping up the Assad regime, the Iranian priority is to complete a Shia corridor through the country giving Tehran a land bridge to the Mediterranean Sea. Tehran must take one of three primary arteries from Iraq into eastern Syria to make their land bridge contiguous. One path runs through the Raqqa warzone on the Euphrates River where the U.S.-backed Syrian Democratic Forces are currently engaged. That's where the U.S. downed the Syrian fighter jet. Another potential corridor runs to the southeast through Deir el-Zour from the Abu Kamal-Qaim border crossing. The province remains largely in the hands of the Islamic State and was the target of Iran's recent launch of ballistic missiles. Iraqi militias backed by Iran already took the border town of Ba'aj from ISIS and told the Guardian they are exploring possible paths to create a supply line to Deir el-Zour that could bypass the crossing. The most strategic passage, however, is the main highway connecting Baghdad to Damascus in the southeast along Syria's border with Jordan and Iraq. That's where the U.S. and allied forces set up shop with a military outpost next to the Al-Tanf border crossing. 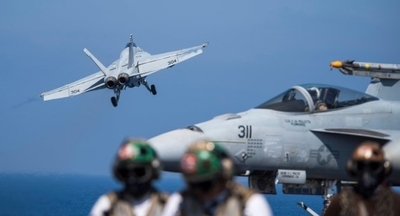 The de-confliction area recently became a flashpoint, prompting the U.S. to down several Iranian drones in the past few weeks. With U.S.-aligned forces increasingly under attack, they moved a High Mobility Artillery Rocket System (HIMARS) into the area from Jordan to dissuade Iranian-backed militias from targeting American troops. These events at all three strategic locations aren't isolated incidents but the opening salvo in the next phase of the Syrian conflict. In Washington, however, few in the Trump administration are willing to publicly state the challenge Iran presents in Syria. According to a recent article published in Foreign Policy, Secretary of Defense James Mattis, Chairman of the Joint Chiefs General Joseph Dunford, and the lead U.S. diplomat and Obama-holdover, Brett McGurk -- who is overseeing the anti–Islamic State coalition -- all favor keeping America's military focus on ISIS and away from Iran's proxies. That position was reinforced with the U.S. Combined Joint Task Force statement that reaffirmed the "mission is to defeat ISIS" not the Syrian regime or those associated with Assad. Colonel Ryan Dillon, the spokesman for the U.S.-led coalition, went even further addressing reporters: "We as a coalition are not in the land-grab business. We are in the killing-ISIS business," Dillon explained, "and if the Syrian regime wants to [fight ISIS] and they're going to put forth a concerted effort and show that they are doing just that in Abu Kamal or Deir el-Zour or elsewhere, that means that we don't have to do that in those places." This antiquated definition of America's interest in the conflict will prove to be untenable as Iranian-backed forces continue to gather and encircle U.S. positions. Moreover, the message it sends to Tehran reads more as an invitation, not a warning. Destroying ISIS in order to return the territory to Assad is tantamount to giving it to Iran. If that is really the goal, one must ask why American military forces are in harm's way in Syria, in the crosshairs of the very nation the U.S. is helping to succeed? It would be better to return home as the trajectory of the war indicates that Assad will emerge victorious in a matter of time absent an American military presence and leadership. The answer is that for the United States, the war in Syria should be more about Iran than ISIS. Without a plan reflecting that priority or at least putting it on par with the defeat of the Islamic State, the regional objectives President Trump laid out are sure to be undermined. In that scenario, there will be little hope of holding together any outside Sunni coalition. As Iranian proxies gather strength in Syria's southwest near the Golan Heights, Israel or Hezbollah will feel compelled to act militarily and all of Lebanon will be drawn in. The next iteration of ISIS will surely form in the Sunni-majority regions in the heart of the Middle East -- rendering as a wasted effort today's narrowly defined mission. And as it unfolds Iran will be several years closer to possessing nuclear weapons. "The Islamic State is the military target of our forces in Syria," a senior White House official told this author Tuesday. He chose his words deliberately. "That doesn't mean we don't understand the broader geostrategic reality and the interplay of all the other actors involved in the theater," he continued. "All of the principals in the administration are fully aware of the complexity of the situation." When pressed further on how the U.S. plans to push back on Iran in Syria, he replied, "Look, the situation in Syria is exclusively the situation in Syria. What we have in Iran is an expansionist, terror-sponsoring, theocratic, globally ambitious actor. Since Day One that reality has been in the forefront of our minds. One should not underestimate the seriousness with which this White House takes the issue of Iran." That's a refreshing acknowledgment from the White House that could very well mean more is in the works than meets the eye or that can be said publicly. With the nuclear deal under a top-to-bottom review by the National Security Council, there are still several paths available to the Trump administration to contain nefarious Iranian behavior in areas not covered in the agreement. One such effort is reflected in the new sanctions on Iran's ballistic-missile program and Iran's Islamic Revolutionary Guard Corps that recently passed the Senate by a 98-2 margin. An even more meaningful way to do so would be to push back on Iran's advances on the ground in Syria, including through covert means. Syria today represents the center of the new Great Game in the Middle East. Navigating it may require the ability to play three-dimensional chess but the cost of allowing Iran to complete their land bridge poses a long-term threat to the U.S. and its allies. Despite most of the rhetoric coming out of Washington, the answer to the war in Syria evolved long ago beyond the question of the Islamic State and the future of Bashar al-Assad. The balance of power in the Middle East depends on America adapting its regional strategy to fit this new reality.